For anyone who grew up in the 1980’s and 90’s, serial killer extraordinaire, Jason Voorhees, is like a member of your family. Granted, that would be a whacked out family reunion, but nevertheless, the Friday the 13th movies were a part of the fabric of 80’s/90’s culture. While the original Friday the 13th wasn’t the first slasher flick, it did perfect the stalk and slash formula that we have grown to know and love. What Halloween did, Friday the 13th did bloodier. The franchise’s influence was widespread. It basically invented the entire killer in the woods sub genre of slasher films. When I found out that a Friday the 13th documentary was in the works, I had to get my hands on it. I’ve been a fan of the series for as long as I can remember. Seriously, I can’t NOT remember loving these movies. They’re certainly not high art, but they’re a fantastic nostalgia trip to the past. All previous F13 documentaries have always felt too short and not very fulfilling. The features on the original box set only encompassed the first 8 movies in the series. The feature on the Jason X disc tried to tell the full story but New Line Cinema didn’t have the rights to the Paramount films, so they couldn’t delve too deep into the original 8. For the longest time, there were rights issues preventing a comprehensive look at our favorite masked maniac. The His Name Is Jason set (which was made by the same folks) was far too abbreviated for my tastes. While that disc would serve well for someone mildly interested in the Friday the 13th lore, it came off more as a pop culture look at the franchise. Brevity is certainly not an issue in the case of Crystal Lake Memories: The Complete History of Friday the 13th. Based on Peter Bracke’s book of the same name, this documentary borders on 7 hours. That’s not a misprint! This thing takes it’s time and goes through every single movie in the series, including Freddy Vs. Jason and the reboot. It doesn’t just gloss over them either. It gives details on cast, crew, effects, writing, response, direction. Everything. There are interviews with most of the actors/directors/effects artists from the series. As a fan, you actually learn something from this set. It’s not the same soundbites that you’ve heard a million times. The depth of the discussions is absolutely amazing. It’s fascinating to hear about these movies from the people who actually made them. It’s interesting to hear why certain choices were made and how they did or didn’t work (Part V, anyone?). The documentary is broken down into chapters stylized after the film that it’s discussing, straight down to the title cards. Corey Feldman (who played Tommy Jarvis in the iconic The Final Chapter) narrates while also starring in new scenes that bookend the entire program. When I first heard that Feldman was playing such a heavy role in this, I initially had my reservations. To put it nicely, I’ll just say that he can be a bit…trying. However, he does a fantastic job keeping the story moving while never becoming the focus of it. The best part for me was seeing the discussion about Kane Hodder not being chosen to play Jason in Freddy Vs. Jason. Fans have been upset over that decision since it was first announced. It was nice and touching to hear the real story behind it. It’s clear that this documentary was made by fans of the series. It’s clear that it’s made FOR fans of the series. However, I think anyone interested in the horror movie genre will find this set fascinating. There is a lot of time spent on the low budget nature of the filming. This set is truly a labor of love, and that love translates to the audience. Do yourself a favor, pick up this set. If you even have a passing interest in the Friday the 13th franchise, or slasher films in general, you’ll really enjoy it. I can honestly say, I never thought I’d wished a 7 hour film was LONGER! 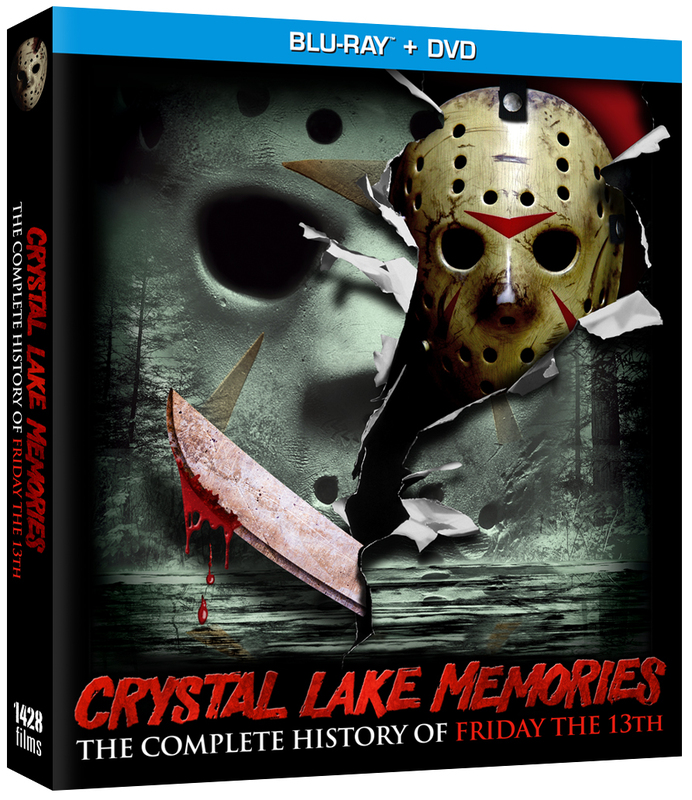 For more information on Crystal Lake Memores: The Complete History of Friday the 13th, click here to visit their website! Pick up Crystal Lake Memories on Amazon to help support this site!